For thousands of years in folklore and traditional medicine, stones have been used for healing, protection, and stimulating or moving energies. All crystals and gemstones are living organisms, and contain a life energy of their own. They are evolving entities, growing in clusters that can take thousands of years to fully mature. 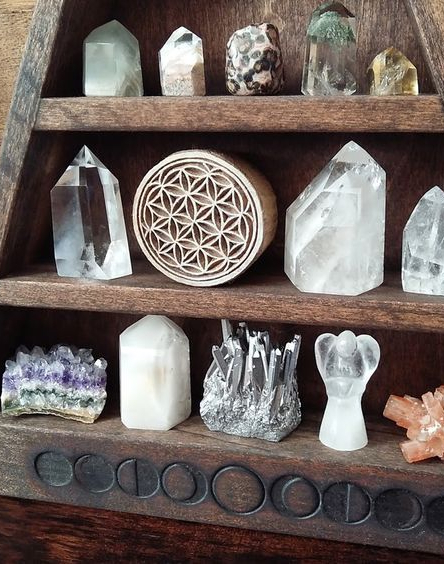 Each stone vibrates at its own individual frequency, and each unique vibration that they emit are said to affect us in a vast array of ways. Many crystals and gemstones are as old as our planet itself, and some even originate from unknown sources in our cosmos, such as moldavite, which was found inside and partially formed within the crater of a meteor that struck in Southern Germany about 15 million years ago. In Traditional Chinese Medicine, the use of stones provides the most profound and permanent effects to treat the most difficult of diseases. Ancient healers contend that the density and solidity of stones represents a stabilizing effect. Wearing specifically prescribed stones near your body over a length of time is said to promote the healing of a chronic health condition, or promote evolutionary changes and development. Stones can be used in combination for a synergistic effect, just as the process of combining herbs when formulating an an elixir or tonic. Preparing stones through cleansing, clearing, and recharging is imperative. One can purify stones and crystals by submersion in salt water, smudging with Palo Santo or Sage, and soaking beneath sunlight and moonlight. Originally discovered in Ethiopia, obsidian is a dark volcanic glass formed by the rapid solidification of lava without crystallization. It has been used for thousands of years for ritual ceremonies, pottery, and weapons. Place Obsidian near your entryway in a planter or on a table or altar to ward off anything negative from entering your home. “Wash” yourself on every length of your limbs and up and down your energy centers while concentrating on affirmations to free yourself of emotional attachments that are no longer serving you. Hold the obsidian near your heart center during breathwork and meditation to create an energy of grounded stability and peace. Rose quartz is most commonly found in Brazil, India, South Africa, and Madagascar. It has a blush tint due to its contents of titanium, iron, manganese and an aluminum boro-silicate called dumortierite. Traditionally, it is said to dissolve emotional wounds, fears, and resentments, promoting loving energy to circulate throughout your body and essence. Rose quartz can induce receptivity to beauty of all kinds, attracting love and restoring trust and harmony in existing relationships. Place rose quartz in the Southwest corner of your bedroom to attract abundance of love and balance existing relationships. Wear a rose quartz pendant in level with your heart energy center to create a flow of peaceful, loving energy in your life. Citrine is formed when amethyst undergoes extreme heat exposure. Rio Grande do Sol in Brazil is the world’s largest supplier of natural citrine, but other mines can be found in the USA, Russia, Madagascar, England, France, Scotland, Spain, Brazil, and South Africa. Citrine will aid in increasing confidence, therefore making it a fluid path to manifesting wealth and abundance of all things. Set an intention of that which you wish to manifest, and hold a citrine near your solar plexus energy center. Place a genuine citrine in the Southeast corner of your living room and office, preferably both on a wooden surface and near a water fixture like a fountain or water vessel. What stones do you use in your home or wear as jewelry?